Art is timeless and these 25 most famous paintings in the world are testaments to it. A piece of art can transcend the time it was created. The artist may not know it yet during the time he labors on his masterpiece but there’s no limit to its impact once it’s done. Art is so powerful it can influence our culture, society, and the world. While it may not be the most lucrative job in the world to be an artist, history has proven that devotion to one’s craft can bring prestige and yes, even monetary gain. Some artists are fortunate enough to experience it while others didn’t live long enough to benefit from it. Just look at the value of the most expensive stolen paintings in the world. These artists probably had no idea that their works would fetch millions of dollars. These popular paintings are curated based on their popularity, relevance to the times, and worldwide impact. We also factored in their contribution to the arts in general (i.e. if it ushered in a new genre or triggered an art movement) and historical value. Pablo Picasso once said, “The purpose of art is washing the dust of daily life off our souls.” Let’s begin the cleansing and start basking in the beauty of these paintings! This 1434 oil on oak painting goes by other names such as The Arnolfini Wedding, The Arnolfini Marriage, and Portrait of Giovanni Arnolfini and his Wife. Created by Netherland native Jan Van Eyck, this iconic painting was acquired by the National Gallery of London in 1842. The man in the painting, Giovanni di Nicolao Arnolfini, is a member of a merchant family from Lucca. Contrary to what most people think, his wife is not pregnant in the painting. The convex mirror behind the couple is one of the most notable parts of the painting due to its attention to detail. The glistening chandelier also reflected Realism at its finest. It is the oldest painting ever rendered in oil and Eyck is known as the first to ever master oil painting. If the piece is auctioned today, it would fetch for over $123 million. 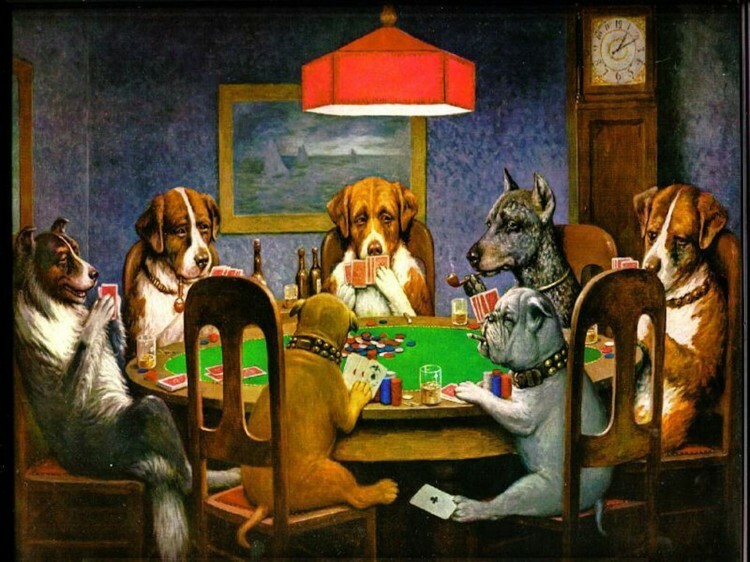 Cassius Marcellus Coolidge is an American artist known for creating the Dogs Playing Poker series. It is composed of 16 paintings created in 1903 for Brown & Bigelow, an advertising firm. Seared into American consciousness, the most popular work in this series is A Friend in Need where you see two dogs cheat with one passing an ace to the other. Prior to the commissioned series, Coolidge created the Poker Game in 1894, which was sold on November 18, 2015, at an auction at Sotheby’s for $658,000. His two other paintings A Bold Bluff and Waterloo were sold at $590,400 in 2005.